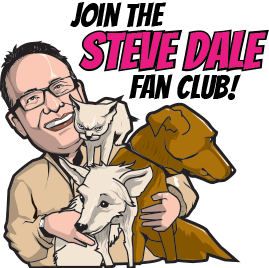 Steve Dale, certified animal behavior consultant (CABC), has reached more pet owners over the past few decades than any other pet journalist in America. He is the host of two nationally syndicated radio shows, Steve Dale’s Pet World and The Pet Minute (together heard on more than 100 radio stations, syndicated Black Dog Radio Productions, since 2005). 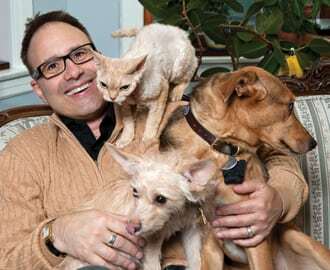 He’s also a special contributor at WGN Radio, Chicago, and program host of Steve Dale’s Pet World (since 1997). He formerly hosted the nationally broadcast Animal Planet Radio. For 21 years, his twice weekly newspaper column was syndicated by the Chicago Tribune. Steve was a contributing editor for USA Weekend (2002 to 2014), and regular columnist at Cat Fancy magazine (2006 to 2014). He has written for a long list of magazines, from People to Dog World (where he was a columnist). He’s currently a writer and contributing editor for CATster, and authors a column called Steve Dale’s Vet World for Veterinary Practice News. He’s also a columnist for the Journal of National Association of Veterinary Technicians in America and PetVet magazine. He also contributes blogs for various websites, including for Victoria Stilwell. On TV, he’s appeared on The Oprah Winfrey Show, National Geographic Explorer, Pets: Part of the Family (PBS), Fox News, various Animal Planet shows, and many others. For several years, Steve was a regular contributor to Superstation WGN-TV morning news, then appeared regularly on WMAQ-TV, Chicago. Currently, he’s a contributor to nationally syndicated HouseSmarts TV. Steve’s also a frequent host of satellite media tours. In print, he’s been quoted in the Wall Street Journal, USA Today, Los Angeles Times, Redbook, various veterinary publications, and dozens more. He has also appeared as an expert guest on countless radio programs. Steve co-edited Decoding Your Dog, written by the American College of Veterinary Behaviorists (Houghton Mifflin Harcourt, 2014). Steve’s the author of ebooks, Good Dog! and Good Cat! (Chicago Tribune, 2013). He’s the author of several other books, including My New Puppy, DogGone Chicago and American Zoos. He’s written introductions or contributed chapters and forewords to many books, including Bonding With Your Dog, Dog Spelled Backwards, The Compassion of Dogs, Raising My Furry Children, Christmas Cats, and Angel Animals and the Kids Who Love Them. Steve is a contributor to textbooks “The Cat: Clinical Medicine and Management” (edited Dr. Susan Little, 2011) and “Treatment and Care of the Geriatric Veterinary Patient” (edited Dr. Mary Gardner and Dr. Dani McVety, 2017). He was an external reviewer for the 2005 Feline Behavior Guidelines (American Association of Feline Practitioners). He’s the primary author of the CATegorical Care: An Owner’s Guide to America’s Number #1 Companion (reviewers include AVMA, SAWA), published American Humane Association/CATalyst Council, 2010). He co-authored (with Dr. Sagi Denenberg) the American Veterinary Society of Animal Behavior Position Statement on Breed-Specific Legislation (2014). Steve is a founder of the CATalyst Council and served on the Board of Directors from 2008 to 2012. After six years, in 2012, he cycled off the Board of Directors of the American Humane Association and served as a National Ambassador. He was a member of the Board of Directors of Tree House Humane Society, Chicago (2005 to 2016). He’s also on the Board of Directors of the Winn Feline Foundation (2007 to present), American Association of Human-Animal Bond Veterinarians (2016 to present). He’s an Advisory Board Member of Chicago Friends of Animal Care & Control (2013to present), SPCA Puerto Vallarta (2016 to present) and Grey Muzzle Organization (2017 to present). Steve is also a part of an AVMA/AAHA initiative to encourage preventive veterinary care, called Partners for Health Pets. In 2014, Steve co-founded Veterinary Professionals Against Puppy Mills, and serves on the Board of Directors. Steve is on the Pet Partners Human-Animal Bond National Advisory Board (2015 to present) and National Advisory Council Member American Association of Feline Practitioners (20016 to present). He was National Advisory Board Member Angel on a Leash (2005 to 2016) and Task Force on Feline Sterilization (2015 to 2017). Steve’s a speaker for American Association of Feline Practitioners Cat Friendly Practices and the Fear Free Initiative. He’s on the Fear Free Advisory Council (2013 to present) and is the Chief Correspondent Fear Free Happy Homes. In Chicago, Steve created the Chicago Task Force on Companion Animals and Public Safety (2000-2010), where three-times proposed breed bans were over-turned and twice over-turned proposed mandated pediatric spay/neuter, as well as proposed pet limit laws. The Task Force also created guidelines for ‘doggy day care.’ As a pet advocate, Steve has testified many times against breed specific bans, pet limit laws, etc. in the Chicago area and elsewhere. Steve regularly advised Illinois Governor Pat Quinn regarding pet-related issues. Among Steve’s many awards, the AVMA Humane Award (the only AVMA honor bestowed to a non-veterinarian), Editor and Publisher syndicated newspaper Feature Writer of the Year Award, AKC Responsible Dog Ownership Public Service Award (twice), HSUS Pets for Life Award, American Humane Association Media Award, American Pet Products Association Pet Industry Outstanding Media Representative of the Year, and has been honored with over 15 Maxwell’s Awards from the Dog Writer’s Association of America and over 15 Muse Awards from the Cat Writers’ Association of America. He’s also been honored by the Chicago Veterinary Medical Association, University of Illinois College of Veterinary Medicine, Friends of Chicago Animal Care and Control, and was the first recipient of the Winn Feline Foundation Media Appreciation Award, and many others. After his beloved cat Ricky passed away in 2002 of feline hypertrophic cardiomyopathy (HCM), Steve created a fund to raise money to research this often-fatal disease. He’s helped to raise over $200,000 – and as a direct result a genetic test was created to determine if a gene defect for HCM exists for two breeds. Steve’s a regular speaker at veterinary and shelter conferences around the world, and for shelter fundraisers, and other special events, including SXSW. Steve’s presented at each of the major U.S. veterinary conferences (numerous times), and at state and regional meetings as well as at veterinary schools, and several times for the International Association of Animal Behavior Consultants. He’s also spoken at the World Small Animal Veterinary Association Conference (Sydney, Australia); CICA Animal Behavior Conference (Mexico City, Mexico); Latin American Veterinary Conference (Lima, Peru); Congreso Veterinario de Leon (Leon, Mexico); Caribbean Veterinary Conference (Sr. Kitts); and (via Skype) Australian and New Zealand College of Veterinary Scientists Veterinary Behaviour Chapter Science Week (Brisbane, Australia).